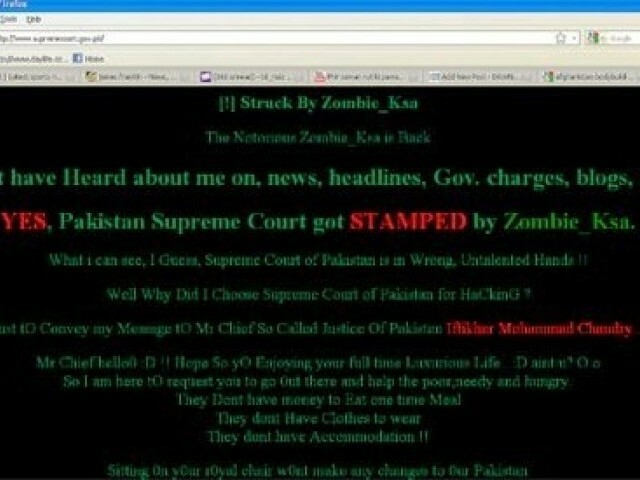 The official website of Pakistan's Supreme Court has been hacked.Visitors to the website found derogatory and abusive remarks about the court and Chief Justice Iftikhar Muhammad Chaudhry. Earlier the Supreme Court website was hacked by two boys also in the month of September last year to whom the court had granted bail on April 11 as they were less than 18 years of age. The hacker declared that his intent to deface the site was ideological in nature to send a message to the Chief Justice of Pakistan Iftikhar Muhammad Chaudhry: “I am here to request you to go out and help the poor, needy and hungry. They don’t have money to eat one-time meal, they don’t have clothes to wear, and they don’t have accommodation … sitting in your royal chair won’t make any changes to our Pakistan.”.